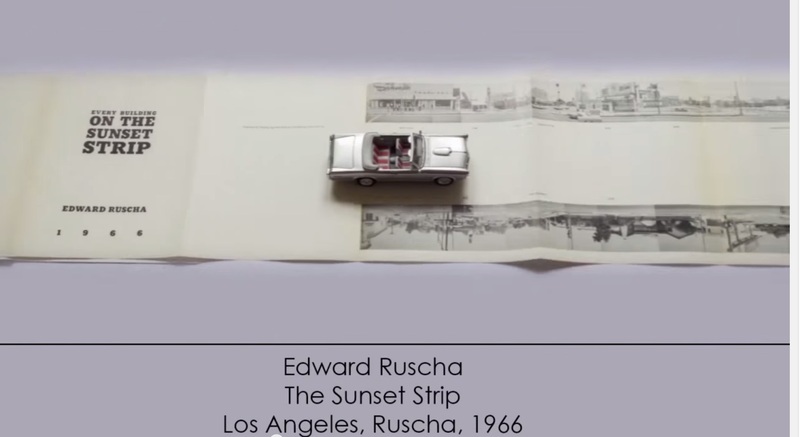 Every Building on the Sunset Strip (1966) Ed Ruscha Opened and described by Cathy Chambers. From his series Le Vite dei Libri (The Lives of Books), Giulio Maffei provides a clever catalog entry on the Sunset Strip. Display of Ed Ruscha’s Various Small Fires and Milk (1964) at “Pliure: La Part du Feu”, 2 February – 12 April 2015, Paris. Photo credit: Robert Bolick. Reflected in the lower left hand corner is the display of Bruce Nauman’s Burning Small Fires; in the upper right corner, the film clip of Truffaut’s 1966 Fahrenheit 451; and in the upper left, Maria Helena Vieira da Silva’s La bibliotheque en feu (1974). Ben Hoyle, “Ed Ruscha, the pop painter with ‘the coolest gaze in American art’“, The Times, 25 February 2017. Ben Hoyle’s easygoing interview with Ed Ruscha introduces his work as the heart of the British Museum’s exhibition “The American Dream: pop to the present” (9 March 9 to 18 June 2017). That is a bold assertion as the show included Claes Oldenburg, Jasper Johns, Andy Warhol, Roy Lichtenstein, Cy Twombly, Louise Bourgeois, Robert Rauschenberg and others recognizable to anyone who was briefly awake in a college art history class — even as long ago as the 70s. But, back then, not so much “Ed Ruscha”. Hoyle’s article – with its paragraphs’ casual packing in of news, telling descriptive detail and sharp observations (whether his or others’) of Ruscha’s art – makes a persuasive case. Abigail Cain, “Unpacking Ed Ruscha“, Aperture, 27 September 2018. I am wide awake when I see artist books. Here are people using actual ink on paper in the eventual age of total digital. For this reason I am retaining my hope and expectation of more books. From interview with Stephanie LaCava, “Artist Books/Artist’s Novels (Vol. 5): Ed Ruscha”, The Believer, 20 February 2017.